​Rena is the ultimate dog trainer. She has unlimited understanding and brings out the best in all the dogs lucky enough to be under heir tutorage. 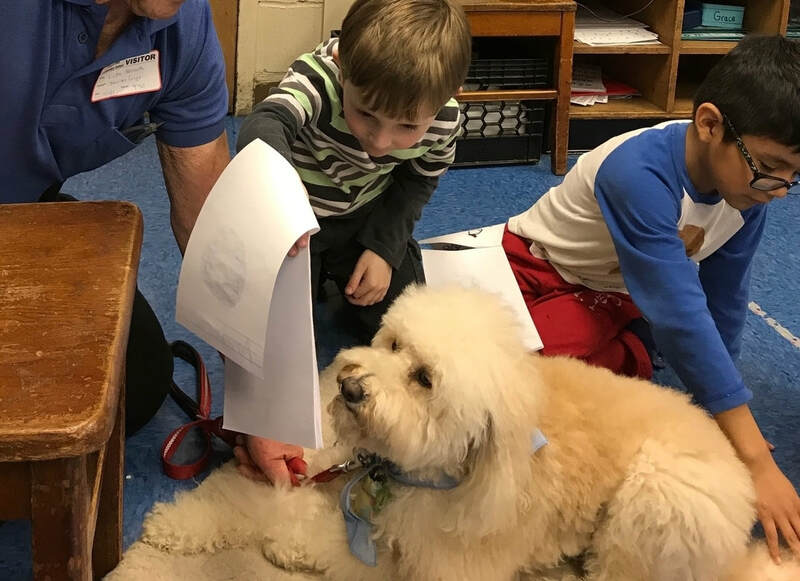 ​Thanks to her varied training techniques, Daisy is now a therapy dog visiting a hospital-affiliated children’s program and being read to by many children including two classes of very low-functioning children in a public school setting. Under her guidance, Daisy has also mastered several tricks to help entertain the children. Rena, thank you for making this all possible." Rena suggested rearranging the furniture - the sofa which Annie sits on was by the front window and very near the front door - as soon as Rena left we rearranged the furniture. It was AMAZING how a simple thing like that distressed Annie. She immediately calmed down and now rarely barks! Still working on the "going crazy". We do see some progress. ​Rena, you will be glad to know that Annie is not the first one to go out the door any more. She sits by the door and upon command comes out after us. Thank you! Thank you! Thank you! We are so glad we found you! You are THE BEST!" 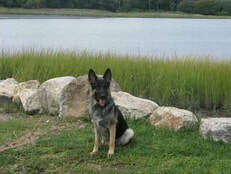 We are owners of a 12 year old female German Shepherd Dog and purchased a female GSD from a breeder at 9 weeks of age. Our new puppy settled in well with our family and the older dog, but was really nervous and would bark, growl and show her teeth when she encountered a person or dog she did not know. We had tried “positive puppy training sessions” which taught her basic commands and tricks, but did not correct the reactive behavior. We have always had German Shepherd dogs, and know they are very intelligent, can be protective over their family, and may even be nervous - but her behavior was extreme for a puppy. We were recommended to Rena by a mutual acquaintance. It did not take long for our puppy to get accustomed to Rena and her methods. We were able to develop techniques to properly train our dog to listen to our direction and correct the unnecessary reactive behavior. By example, giving her a task such as carrying a stick in her mouth while on a walk improved her listening and attention and decreased unwanted reactive behavior. It provided her with a “job” and boosted her confidence. Using Rena’s techniques, we are able to walk our dog without incident, and have increased her ability to be in social situations. Rena is a professional trainer with many years of experience. She is extremely knowledgeable of all breeds and temperaments and is dedicated to the success of her clients and their dogs. She has a true love for what she does and is a pleasure to work with." Rena knew in five minutes that the harness Chica was wearing was creating her aggressive problem when walking. We changed to a choker collar, began using a clicker and treats to reward appropriate walking behavior, and magically we have a new dog! Now we're working with Rena's help to get Chica to tell us when she needs to go to the bathroom outside. Thanks Rena!" Rena is a top trainer. If you looking for your dog to be trained or to be trained for level where you can compete, RENA is a perfect trainer. Having a trainer that has passion & the ability to relate to every single customer is exactly what you get with RENA as trainer...Honest & candid RENA gets you to have your pet trained. Having many dogs with many that are difficult to train, RENA would be my choice for all my dogs to hire her to train." Rena has trained both of my dogs and I don't know what I would have done without her. Clancy who is a golden retriever alpha male was a problem as soon as I brought him home. At 7 weeks he tried to intimidate my 7 year old golden and me. As he grew so did his behavior go from bad to worse. I had gotten a dog trainer but for 8 weeks he had not stopped him from biting, ripping my clothes, cornering me as I tried to walk and lunging at me. At the end of the 8 weeks of home training he told me to use the citronella spray collar on him for bad behavior which of course did not work as Clancy thought this was fun. I was going to work black and blue and bitten and did not know what to do. My vet suggested Rena so I called her and she came to my home. Rena evaluated him that night and stopped him from going after me. I do not know what she did but after she left Clancy was a different dog. This was in one session! As she continued to work with Clancy he became a wonderful dog and she also told me what to do as I never had a dog like him. Clancy would have ended up in the pound if I did not have him and I had 4 goldens prior to getting him so I knew what I was doing but he was an exceptionally hard to handle dog. Clancy is now almost 7 and is doing great. I adopted Mary - a rescue Newfoundland puppy four years ago and Rena also trained Mary. She did not have any issues but because of her size - 130 pounds - she needed training. Rena was great with Mary as well. Rena is a superior dog trainer and I would highly recommend her to train all dogs from small to large and any disposition. If she had not come to my rescue I may not be writing this testimonial today as Clancy may have done away with me!" Rena has successfully helped us train two dogs with two totally different personalities. Our first dog, Sunny, a golden retriever, was very shy and nervous. Rena worked closely with us to help her become more social and less fearful. She helped us transform a dog that started out scared of everyone new and helped her become a wonderful calm dog our family could trust and live comfortably with. After our dog passed away Rena helped us train our new puppy, Chip, a chocolate lab, who was extremely friendly but very strong willed and rambunctious. She helped us learn to set limits and taught us how to manage a dog who clearly wanted to run our house! For every difficult behavior our dog engaged in she had a strategy for. In between lessons we were able to text or call her when something new came up and she always knew what to do. Because of Rena we we able to transform two difficult to raise dogs into wonderful pets for our family." I would like to thank Rena for all the hard work she did working with my three terriers. She has trained me how to train them and to respect me while working with them. I love my dogs but she knew I "humanized" them as children and helped me to correct that problem. I also want Rena to know that without her assistance, Charlie would have never have won the dog show and come home with ribbons and a picture with the judge and breeder. Thank you for everything." We took our lessons in the evenings at the Rockville Center Recreation Center where Rena is the dog trainer. We enrolled in the puppy class and were joined by other young pups and pet owners. Tessa got off to a good start. As it was a family affair we continued lessons weekly. Both my husband and I had a lot of fun. Tessa got a good foundation in Rena’s classes. She sits waits, rolls over and best of all heels. Our little girl is still a work in progress. Rena is professional; she understands what my pet needs and knows how to get us there. I look forward to many more training sessions! Thank you, Rena." We had Rena as a dog trainer and she helped a lot!" I asked Rena to help me correct some rough playing and nipping issues with my 8 month old Mini Poodle, Andre. I was amazed at how she assessed the situation and gave me the right tools, in one visit! Andre is well on his way to being a perfect little gentleman. Rena is firm but loving with Andre. She is also an honest and very nice person. I highly recommend her!" As first time dog owners we were excited and intimidated...we then found out that our rescue Mutt was partial Belgian Malinois. They are known for their intelligence and protective instincts. Several friends commented that we had better get a trainer or the dog would begin to train us! That is when we found Rena. Our vet recommended her to us and I honestly don't know what we would have done without her! ​Even though Dexter is still a puppy (6 months old) I feel we have a real firm foundation. It is true that she has a technique for just about any 'unwanted' behavior. Her technique is to use positive pairing rather than punishment and the results are amazing! Rena also really knows dogs and we appreciated all of her bits of wisdom since this is such a new experience for us. I look forward to continuing in Rena's group classes now, so that we will have not only a well behaved dog, but a socialized one as well." Sammy, our two year old Havanese, is being trained by Rena. Sammy has been a barker, territorial and aggressive. Sammy is much better in the house now and we are working on him becoming a much more social dog. Rena is great with Sammy and has taught us many skills. I would recommend her to anyone whose dog needs some training." 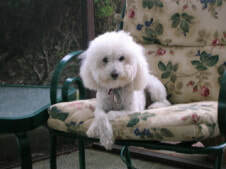 Fourteen years ago, Rena came to train our Standard Poodle puppy, Daisy. Daisy was tough, stubborn and she would just shut her eyes when she didn't want to cooperate. Rena used patience, skill and love, and Daisy became the "best-dog-of-my-life" under her tutelage. Two years ago, we rescued Oliver... a five year old cutie with some issues from his past life. Again, Rena to the rescue - and Oliver has overcome his problem behaviors. If I ever have the gift of getting another dog, the first person I would tell would be Rena, for sure." 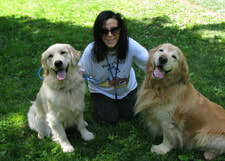 Rena helped train my 100lb Goldendoodle Mowgli and me to become a pet therapy team. We took her group class where Mo was awarded his CGC and took private lessons to better prepare us both for our certification test. Thanks to Rena, Mo has been an amazing Therapy Dog, volunteering for over two years. Rena is a great instructor and a pleasure to work with - I wouldn't hesitate to recommend Educated Paws!" Rena's mantra is that a well-behaved dog is a pleasure to be with, can be taken just about anywhere, and is less work for the owner in the long run. Rena practices what she preaches; she is disciplined but very kind, and if you do your homework, you will be in possession of a great dog. I should know. Rena helped me train Gracie (a very frightened and neurotic dog that I should have returned to the breeder but was afraid, and rightly so, that no other family would take her); Katey and Mikey; and now Olley and Keeley. Rena is wonderful and I wouldn't trust my dogs with anyone else." 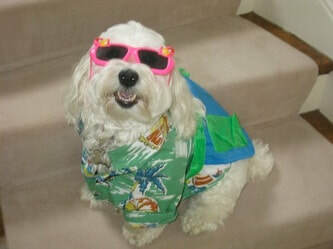 Rena came to us by recommendation 7.5 years ago to train our beloved Havanese, Broozer. Rena's knowledge, patience, keen insight, understanding, and love led to our Broozer being a fabulously trained dog. He was even taught to ring a cowbell when he wanted to go outside! Broozer religiously looked forward to her weekly visits. He adored her and so do we. Six months ago we decided to get another Havanese named Webster. Rena was the first to be notified. Our new love of our lives, Webster, is currently being trained by Rena - a work in progress. There would be nobody else we would think of turning to to help train our dog. Rena is the best and we highly recommend her." Thanks for doing a wonderful job training our young black lab, Hudson, and providing us with invaluable training tips along the way. Hudson is walking beautifully on the leash and is learning all the key commands off leash. He is well on his way to becoming a beautifully trained and obedient dog." Rena has done a spectacular job training our Golden Retriever. Bayley is a most enjoyable dog who likes shopping at Nordstrom and Bloomies and always gets invited back. I recommend Rena to work with any dog and family." This is our second time around with Rena! 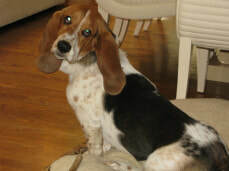 She had trained our beloved basset hound Brandi over 15 years ago, who has since left for Rainbow Bridge last March. 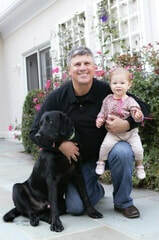 Brandi had a really solid training foundation, she understood many commands and was a joy to be with. Now Rena is training our new baby basset Gabby. Rena started training Gabby from 3 months on and has been invaluable in helping us every step of the way, from our first wee wee pads to the fact that Gabby NEVER has any accidents. She has been indispensable in helping us get through every stage of puppyhood, which at times can be quite challenging! Rena has incredibly creative ideas and training techniques we never would have thought of on our own. We simply couldn’t have survived the last 9 ½ months without Rena’s guidance, support, expertise and caring. Quite simply, she is the best!" My dog Roxie is a year old, and I am glad to say she is beautifully trained and has great manners. She is in training to be a therapy dog. I travel a lot and I am very social and I chose a dog I can take with me. With Rena's guidance, Roxie is great with adults, children, dogs, and cats, and I am comfortable bringing her everywhere. I whole-heartedly recommend Rena and Educated Paws. She has great experience with small and large dogs. I wouldn't have known what to do without Rena." We have known Rena for almost 25 years. She is fantastic with my "pups" and really knows how to train them, not only for obedience but also to make sure that the dogs are sweet, good-natured and non-aggressive. She is always available with advice even after my sessions have finished if a future problem should arise. I have always trusted her with my dogs and have complete confidence in her training ability." Rena, you are tops! You took an undisciplined little dog and turned her into a well-behaved young miss. She likes boarding with you too. Thanks!" Rena from Educated Paws trained our first Wheaton Terrier, Jonesy. He was great -housebroken and obedient with manners, and we enjoyed him for many, many years. 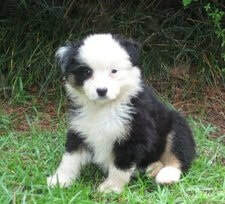 Today we are working with Rena again with our new Wheaton puppy and gladly report the same results." My dog Honey is a 15 year old Wire Haired Fox Terrier. I adopted Honey from a breeder when she was 6 years old. With Rena's help, Honey became well-housebroken and obedience-trained. She is now such a good dog. Because of her advanced age, I just adopted a 7 year old from the same breeder. My new dog is very timid and unsocialized, and Rena is patiently working with me and my dogs to help them adjust to each other and to me. 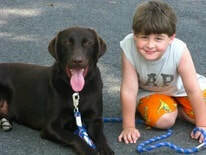 I recommend Educated Paws for dog training." I have been training with Rena for two years and we have taken a puppy who knew nothing about obedience, to a wonderful obedient adult GSD. He is happy when we are training for the obedience and rally competitions. Not only do we have a lot of fun training, the lesson is personalized to what my dogs needs are. Can't wait to get into the ring! Thanks, Rena!" Thank you so much - we love you!" I have enjoyed living with my 4 pets because they have been trained by your methods. I recommend you to any new pet owner to give the gift of training; everyone benefits, the dogs are happier and so are the owners!" 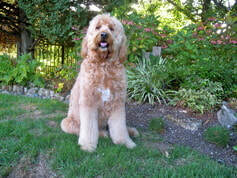 We cannot thank Rena enough for helping us train our Wheaton Terrier, Sammy. 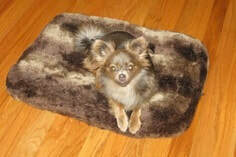 Sammy is the perfect dog for our busy home, he is well-adjusted and just goes with the flow."